A ten hour trip becomes about thirteen given a bathroom stop every hour. Already swollen ankles triple in size. If I poked them with a pin and drained them, I might fill up a swimming pool when I get home. Ohhhhh, is that a contraction??? Eight hours from home??? No, thank goodness, false alarm. But drive quickly just in case! Three children and hubby all have winter coats because prego woman has severe hot-flashes so runs the air full blast 100% of the time. Prego woman gains 10 pounds from snacking the whole time. However, she blames it on water weight, all the while praying that baby hasn’t really gained 10 pounds… OUCH! Marriage is on the rocks when they get home from prego woman screaming at husband to slow down, speed up, watch out for the semi, and good grief, keep your eyes on the dad-gum road! Crud, is that ANOTHER contraction? No, she’s just kicking hard. I can’t think of #10. However, I believe the previous nine are enough to give out the sage advice that traveling this far from home for this short period of time (a day and half) is not, in most circumstances, advisable. Have you ever done anything that, when half-way through, you questioned your sanity? Also, we’re traveling home today, so your prayers for all of the above, as well as safe travels, are appreciated!!! So, very funny, Krista. Have a safe trip home! You poor dear. Traveling is exhausting without being pregnant. Take care and have a safe trip home. Giggles on your post, but also condolences on your condition as I remember too vividly what that experience is like! Hope you arrive safe, sane and healthy. 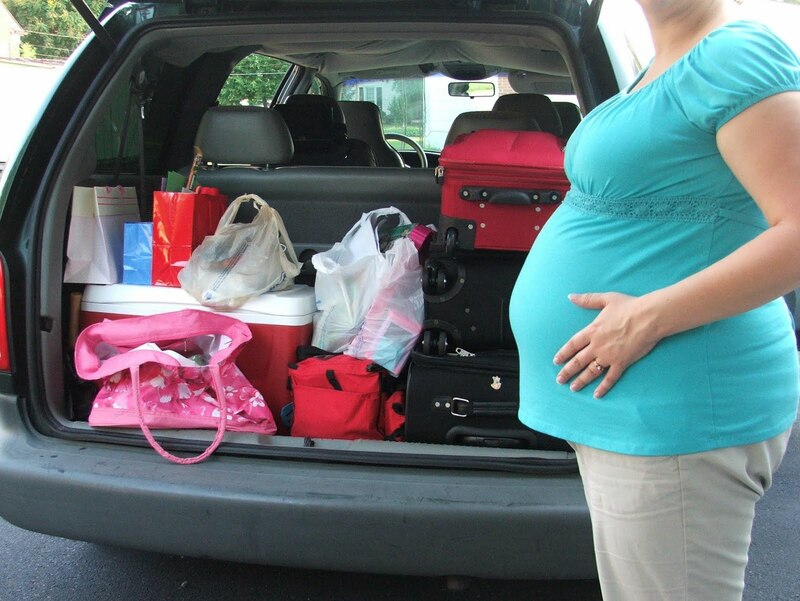 I took a long car trip when I was about 20 weeks pregnant. I can't even imagine it at 34 weeks! It was definitely an adventure. I LOVE humor, Bombeck style, in the midst of hassle. You are amzing, dear one. May God bless you with traveling mercies and a few laughs. They're good for the soul. And thinking something is insane halfway through??? Only every day or so! We are back home, safe and sound. My feet are indeed the size of watermelons. Now, I will go, because I am enjoying putting my bubbling feet up:-) Geez… could I complain anymore??? Note for everyone: I am not usually a complainer like this, I promise! Buwahahahaha!!! You are hysterically funny! You know that, right? If your writing is as funny as you are on your blog, your books should fly off the shelves in sales. Shoot, girl, I had to explain to my husband what I was laughing at! Glad you are home with your roaring bunch. May your feet shrink and your belly rest up for the grand finale. Hope you survived your trip, Krista! And I hope you were able to get everything done that you'd planned! Glad you're home safe and sound, KP. Praying for a safe trip home. Sounds like something I'd do, though I never had early contractions like that. 🙂 I hope that whatever made you travel that far was worth the drive (even if it was tough! ).